The Helpmann Awards were announced last night and the Perth Festival dominated WA’s classical music and opera scene bagging an impressive number. Another Perth Festival production Les Arts Florissants won Best Chamber and/or Instrumental Ensemble Concert for In An Italian Garden. Les Arts director William Christie won Best Individual Classical Music Performance (winning over Asher Fisch who was nominated for WASO’s Beethoven Festival series). 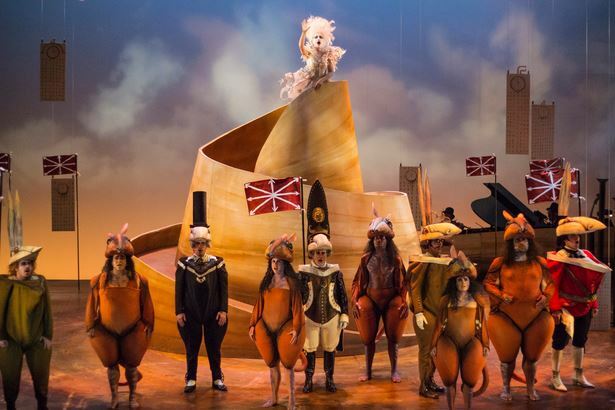 The Rabbits, a picture book by John Marsden and Shaun Tan, is the inspiration for OPERA AUSTRALIA’S most recent opera commission. Marsden’s clean poetry and Tan’s capacity to visually depict otherness and displacement prompted director John Sheedy (BARKING GECKO THEATRE COMPANY) to create an opera that is part music theatre, part puppet show and instantly engaging. The Rabbits premiered at the HEATH LEDGER THEATRE on February 13th as part of the Perth International Arts Festival. The Marsden/Tan book uses the allegory of rabbits arriving in a land of marsupials to tell with simple directness the universal story of colonisation. Opera librettist Lally Katz introduces a narrator the Bird sung by pop artist Kate Miller-Heidke who also composed the music for the opera. The story unfolds with an almost uncomfortable forthrightness. The numbat-like marsupials are sung with warmth and naturalness by indigenous music theatre performers Hollie Andrews, Jessica Hitchcock, Lisa Maza, Marcus Corowa and David Leha. The rabbits (Kanen Breen, Nicholas Jones, Christopher Hillier, Simon Meadows and Robert Mitchell) arrive with Gilbert & Sullivan-esque aplomb singing “English breakfast tea as we spread through the country”. They brandish flags and ride on machinery and teach marsupials to hop in a skipping rope while an accompanying tick tock musical motif makes an aural link to the clocks scattered through Tan’s paintings. The marsupials resist but are overthrown and watch helplessly as their children are removed, a moment made more wrenching by the eloquent passion of soloist Hollie Andrews. Designer Gabriela Tylesova’s set with its blue sky backdrop and earthy floor captures both the vastness of Tan’s landscape and the detailed clutter of the encroaching rabbits. The brown padded costumes for the marsupials and the pointed masks of the rabbits are close replicas of Tan’s figures and cold fluorescent lights embedded within the rabbits’ masks (Trent Suidgeest lighting) adds further characterisation. Miller-Heidke’s melody-driven score is performed by an onstage five-piece band led by arranger Iain Grandage. The constant musical quotations (operetta, marches, Gilbert & Sullivan) establish character and highlight the humour in the libretto but the comedy becomes almost camp, more pastiche than mystique and a long way from the aching sadness of the book. The production captures the detail but only occasionally the transcendence of The Rabbits allegory. The real success is Sheedy’s creation of an all-age opera with a contemporary Australian resonance. The season sold-out weeks in advance and the opening night audience responded whole-heartedly with a standing ovation.